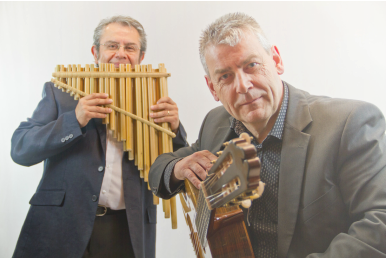 Leo Turner and Carlos Muñoz Villalobos perform music inspired by the rich guitar and folk traditions of South America. Carlos is originally from Chile and has performed for over twenty years as a member of the leading South American group ‘Caliche’, with which he released six albums. He contributed many compositions to these recordings and plays a variety of instruments including the charango, guitar and Andean flutes. Leo and Carlos combine the pure tonal qualities of the classical guitar and the haunting sounds of traditional Andean instruments in performances of delicate South American magic. The duo’s work is inspired by the great masters of the guitar such as Lauro, Villa Lobos and contemporaries such as Santaolallla, creating new music based on beautiful melodies from South America. Leo and Carlos bring many years of performing experience to their work, revisiting the traditional repertoire with a fresh, contemporary feel. In their hands even the simplest and most familiar material takes on new depth and sounds freshly-minted.